Living quarters and "juke joint" for migratory workers, a slack season; Belle Glade, Fla. (LOC) | Flickr - Photo Sharing! Not only did they know what stout was in 1941, but they advertised it and (presumably) folks ordered it. Nowadays, you're hard pressed to find too many places who serve stout unless it's micro-brew bar! - scQue? Wolcott, Marion Post,, 1910-1990,, photographer. 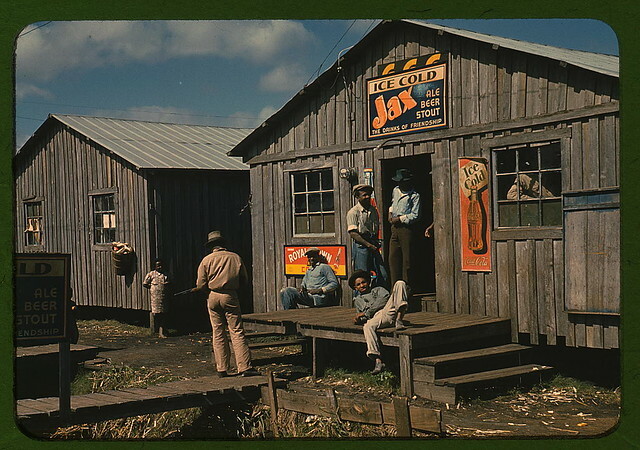 Living quarters and "juke joint" for migratory workers, a slack season; Belle Glade, Fla. Photograph shows man standing to left with gun. Signs advertise Ice Cold Jax Ale Beer Stout and Ice Cold Coca Cola. getthebubbles, David Gallagher, and 212 other people added this photo to their favorites. probably they worked on sugar plantations? "Juke joint (or jook joint) is the vernacular term for an informal establishment featuring blues music, dancing, and alcoholic drinks, primarily operated by African American people in the southeastern United States. The term "juke" is believed to derive from the Gullah word joog, meaning rowdy or disorderly." Reminds me of the bunkhouse in "Of Mice and Men"
If you were to pass through Belle Glade this afternoon you would see a scene almost exactly like this still. Parecem saídos de uma campanha de moda. I bet their employer owned the juke joint, too.